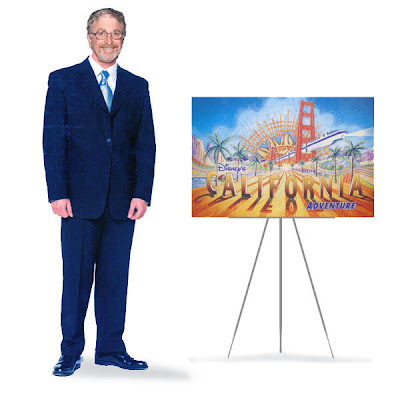 Infamously(not totally fair, btw) associated with DCA, Barry Braverman was in charge of the creation of Califoria's Second Gate. It's fascinating to hear his perspective on things. Of particular interest is Braverman talking about people not "getting" DCA. The former Imagineer seems like a smart fellow. He appears to be a very creative man, but his comments on Superstar Limo are one of the main reasons I'm very happy he's very far from Glendale at this time. I don't blame him for the majority of the mistakes, that falls to Paul Pressler. Braverman has done some great work at EPCOT under much better conditions... when Eisner and the Suits started their penny pinching there was only so much he could do. I'm proud that I didn't "get" DCA. it's a sign of Imagineering from the mid 90s to the early 2000s. There was such a perspective of "you need to see things my way" instead of "let' wow the guest". Very indicative of many dot-coms in the same time period. If you didn't "get it" they didn't want you around. however, in the entertainment biz, that's a deathtrap. Wow this is a really intersting interview, and actually it makes me like Braverman a lot more than I did before. I had heard a lot of the blame for DCA laid at his feet and while I suppose some of that's true, I know he really didn't control the pursestrings. I think the only things I take issue with in his interview are how great he thinks Soarin' is. I think Soarin works as well as it does because the one gimmick it has works so well, not because it everything was designed perfectly. I think there's plenty, PLENTY, wrong with Soarin Over California, and the only thing that's right is how succesfully they captured the feeling of flight. It's like they had the core concept and decided, "if we can just pull this off, nobody will care how sparse the show is, they'll just talk about this effect". And of course for the average guest it's true. What Braverman seems to think though, is that everything in that plot of Condor flats is just gold- "Some people wanted us to hide the machinery, but we said no, we're celebrating man's harnessing big machines to lift him into the sky!". Bull. You couldn't figure out a way to succesfully hide it, so you didn't. Which is fine! Even the best attractions have limitations, but don't fool yourself into thinking that anyone comes off that ride in awe of how big around the steel supports were. I remember hearing that the reason they didn't do more to hide the surrounding hotels and buildings from guests while inside the park was because that urban environment was all part of California and it was intentional. Whatever. I'm really curious to know if that was a Braverman quote. Again, I understand when things are unavoidable, but having that spin come out of an Imagineer really lowers my opinion of the organization. So I dunno, he really sounded much more levelheaded and well spoken than expected and I don't think he tried to defend DCA as much as I thought he would, though perhaps he's a bit out of touch with what people like. I didn't have any problem with his comments on Superstar Limo though. I wonder Honor, if you may have misinterpreted what he was saying. When he said people weren't getting it, I think he basically was saying, the artist who's designs they used put far too much in there, to be seen in that attraction format. Consequently people were missing jokes and puns, things written onthe buildings, etc... Not the same old "People don't get DCA". I think he was acknowledging that for whatever reason, they wern't getting it, but not that it was the guests fault. This may have been said about other things, but I don't think that's what he's saying here. And I do think SSL was judged too harshly. I think SSL may have been the only bad attraction in the park whereas individually most attractions at DCA are well done and entertaining. Together they may not make a good park, but in isolation they are fine. SSL however was bad in concept, design, and execution, and was a very easy thing to point to and say here's another example of how lame this park is, even though it was not reflective of the other attractions. So I'm not saying SSL wasn't bad, only that had the park overall been better, it would have been seen as only a small blemish, instead of a huge zit on the nose, so to speak.